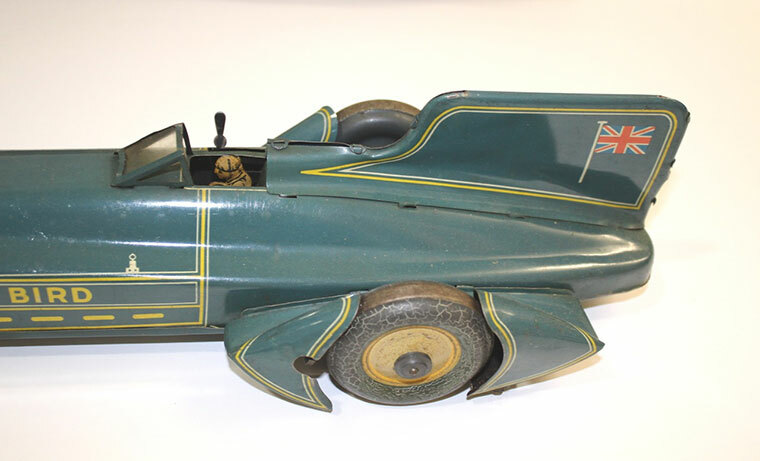 A model of Sir Malcolm Campbell's Land Speed Record Car Blue Bird, is to be sold by Lawrences Auctioneers in Crewkerne. Made by the German makers Gunthermann, this tinplate clockwork model comes with it’s original box. Sir Malcolm Campbell (1885-1948) broke the Land Speed Record in his Blue Bird; a record he broke several times on land and water in various ‘Blue Bird’ vehicles. His son Donald also broke many speed records before dying in 1967 attempting the Water Speed Record. This model car was collected by a gentleman near Devizes, and formed part of a train and toy collection he assembled over his lifetime. The car will be included in the May collectors sale on Friday 18 May, and it is expected to make £500-700 in auction.